Feb 14, 2017: Best way to give sound to bedroom? Feb 24, 2017: Complete noob looking for help and advice. Feb 26, 2017: My current setup. Speakers a little lacking but I hope to fix that. Mar 03, 2017: Should I buy this? Apr 27, 2017: [USA] [$120] Edifier R1280T, Micca PB42x, or something else? May 18, 2017: [USA] Are Edifier R1700BT worth the money? Jul 26, 2017: Dug up an old system that I used to use in my house, no longer suitable for an apartment. Could use some recommendations. Aug 04, 2017: Finally moved and got the monitors mounted. Looking for speaker recommendations! Nov 04, 2017: [USA] [$100 Active/$150 Passive+Amp] - I'm looking to upgrade from my garbage Z313 to a 2.0/2.1 setup, I'd appreciate some insight/recommendations before I take the leap. Dec 12, 2017: My husband is building a "battlestation" (he uses that word all the time) but he just realized his new monitor doesn't have speakers. What are some good ones, and can he use his gaming chair too/instead of speakers? 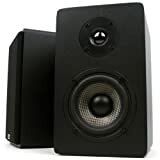 Feb 23, 2018: Standard computer speakers or one big studio monitor or 2 studio monitors(within budget)? Mar 01, 2018: I can get these off Craigslist for $120. Is there anything better I can get for $120? Nov 06, 2018: My wife and I need your help...want a new house audio setup and thought we could reach out to this sub for some assistance. Jan 05, 2019: Tearing out LP120 Preamp, but what do I need to buy to replace it? Feb 04, 2019: Could anyone help me decide (or recommend) which speakers to buy????? Feb 06, 2019: Are the Logitech G560's Good Speakers?